These Macadamia nut waffles will wake your family up to a tropical breakfast.You will think that you are on vacation somewhere in the tropics.Delicious hot pile of homemade waffles with sweet crunchy macadamia nuts, topped with toasted coconut, mix of berries and/or tropical fruits and fluffy whipped cream.It will make your weekend breakfast fancy and special. In a large mixing bowl combine flour,flax,salt and baking powder.Whisk to combine. In a medium bowl whisk egg yolk,milk,vanilla, and oil. In a small bowl whip the egg whites and set aside. Pour the milk mixture to flour mixture and whisk to combine. Add the whipped egg whites and chopped macadamia nuts. Spray both sides of the waffle iron with non-stick cooking spray. 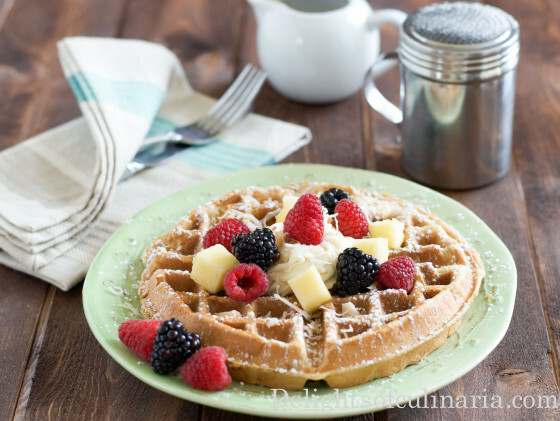 Scoop the waffle batter into the waffle iron and close.Cook depending on your waffle maker. Serve with whipped cream, syrup/pure maple syrup and garnish with desired toppings. hello. looks very delish. where do you buy the whole wheat pastry flour at? You can find it mostly in all stores;Winco,Raleys,whole foods.Bob mill brand. About 6 large round ones.